With all the needed documents and paperwork, applying for a car loan can be quite troublesome. Additionally, most lending firms require loan applicants to have good credit scores. This leaves people with bad credit scores at a disadvantage. If you’re having trouble getting approved for a car loan by lenders, consider going to a buy here pay here Greenville dealership. Residents can easily get approved for a car loan if they go to a buy here pay here Greenville dealership. Auto Store is a reputable buy here pay here Greenville dealership with three other locations in the state. While other shops don’t offer warranties on their vehicles, our buy here pay here Greenville dealership provides customers with a 1,000-mile or 30-day warranty. Through our buy here pay here Greenville dealership, you can finally have the car of your dreams. We don’t get any sensitive information when you turn to us for pre-approval. At our buy here pay here Greenville dealership, all we need is your name, address, and consent to access your credit file. When you turn to our buy here pay here Greenville dealership, you can get pre-approved within minutes regardless of your credit status. Are you looking for a secondhand vehicle in great condition? Your search ends at our buy here pay here Greenville dealership. 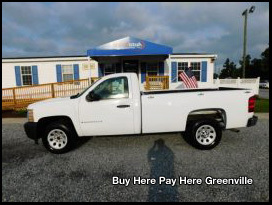 Our buy here pay here Greenville dealership has a diverse inventory of cars, SUVs, and trucks. Drop by one of our locations today to see our vehicles in person. A good way to improve your credit score is with a car loan. A buy here pay here Greenville dealership can approve your loan faster than most other lenders. However, you should be careful when choosing which buy here pay here Greenville dealership to go to. Trusting the wrong buy here pay here Greenville dealership may leave you with even more debt than you started with. Unlike other buy here pay here Greenville dealerships, Auto Store sincerely wants to help you build your credit score. Our buy here pay here Greenville dealership reports to all three major credit bureaus. By applying for a loan at our buy here pay here Greenville dealership, you’re not only purchasing a car, you’re also giving yourself a chance to rebuild and improve your credit score. Get Pre-Approved at Our Buy Here Pay Here, Greenville Dealership Today! Customers that turn to our buy here pay here Greenville dealership don’t have to wait long to get pre-approved for financing. For instant pre-approval at our buy here pay here Greenville dealership, fill out our online form. Afterward, one of our professional sales representatives will get back to you with a payment plan for the car you’re interested in. For more information, contact us today or visit our buy here pay here Greenville dealership. Are you planning to get a new vehicle? Browse our collection of various makes and models at Auto Store! Through hassle-free transactions, we help car buyers get the ride of their dreams. Contact us today. To learn more about our company, visit our website.